Could be a play off of Nemo. Saw this guy riding on a mammoth earlier in Dalaran, on the beta server. Anybody know what he's for? He repairs and buys stuff. When removed from the mount he say "Nobody loves Gnimo"
... Atleast he did when i saw it..
Just seen this guy at the flight point in dalaran talking to Hakmud Of Argus. Hakmud Of Argus says: I thought we were friend, buddy! You leave Hakmud stranded? Gnimo says: Goodbye! You were Gnimo's best friend ever! 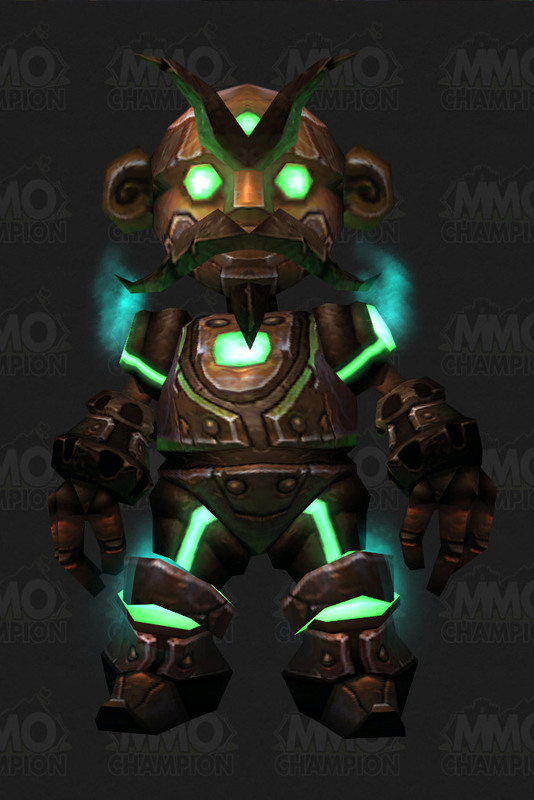 Gnimo is the repair vendor on the Alliance version of the Traveler Tundra Mammoth. He comes along with Hakmud of Argus, a draenei food vendor. Anytime the mammoth is called, these two are spawned and ride with you. When you dismount, or kick them off, they jump off the mount, say a line of flavor text, and soon despawn. Other than what was stated above, Gnimo and Hakmud have no importance. He also says: "Time for Gnimo to shut down." if you eject him. On a side note, Since when are Mechagnomes on the Alliance's side? Anyone else see the joke? "The location of this NPC is unknown."! Treats you without any faction discounts, thus you pay full repair bill. Use if you have to, but save some gold on using normal repair vendors you got yourself Friendly (or higher) with. Gnimo was an ordinary, adventurous gnome, born in gnomeregan, forced to escape with his family to ironforge. His family was a rather poor one, thus he was forced to do various odd-jobs to support his family. He loved to tinker, and while experimenting started an entertainment/theatre comedy with his inventions. After a couple of years, his business went bankrupt and his family was once again plunged into debt and poverty. With no money to buy anything to support his family, he turned into an treasure hunter. His adventures took him far and wide, to the Ruins of Uldum (where he blew a hole in the wall, only to discover an invisible barrier, preventing entry), the now Ruins of Thaurissan, (Dynamite making gone bad, contrary to popular belief and lore), and while on a pit stop rest, the Ruins of Silvermoon (He tried implementing the magic of the elves to his inventions..to no avail). His follies made him pay for his damage, removing much of the profit from his treasure hunting. He was growing desperate and was running out of places to raid for treasure. In the Great Northrend Saronite Rush of November 13, 2008, he took advantage of the surge of people and hitched a ride as a stowaway on a boat. To his misfortune, he was found out and forced to do work in Valiance Keep. On one of his errands, he was taken to Fizzcrank Airstrip, where on one of his missions there, would condemn him to a terrible fate. He was sent to investigate what had happened in a nearby pumping station, with Hakmund as his partner. They had come across a big journal in the top room, when they heard a mechanical voice behind them--Mechazod. Gnimo had been warned about coming across Mechazod at Fizzcrank, if only he had listened. In a flash, him and Hakmund were knocked unconscious. When Hakmund had awakened, he was on a Giant Mammoth, wearing a silly turban, with a stranger at the reins, and accompanying them, on the side opposite of him, was a steel plated, emotionless gnome with the name 'Gnimo' inscribed on its back. Has anybody noticed, that he actually looks like Mimiron, the boss in Ulduar ? Mimiron is only a lil bit higher and more greenish. There's been a Gnimo sitting in the middle of Dalaran for 3 days. He looks so lonely. I wish Blizzard would hurry up and restart the servers. He's been making me sad. One of his quotes, "Goobye! You were Gnimo's best friend ever!" is a reference to elmo from sesame street/elmo show. Their names are also quite similar. Nemo (Gnimo) means nobody in Latin. I just found that kind of funny. Even though it doesn't really matter he's also at 54.1, 74.0 in Icecrown. Hakmud is right next to him. Today I saw Gnimo standing in front of Wonder Works in Dalaran. Maybe he's the new mascot. Same with on Skywall Realm. Is this on every realm? I've been thinking about maybe buy the Travelers Tundra Mammoth but, if i kick one of the vendors off my Mammoth, how can i get them back? I found him at the border of searing gorge/badlands. Just standing there all by himself. I have made an important discovery! When you are under the effects of Underbelly Elixir, Gnimo transforms into a FEMALE mage. EDIT: I tried to upload a screenshot of this, but wowhead declined...as per usual. SO! You'll have to see it for yourself. every time i see this guy i buy something by him so he dont get sad. Gnimo is just sitting at Sentinel Hill. Nobody knows what it is, its fun to see someone try to attack him or talk to him. At least Barney is here to cheer the little poor guy up. Isn't it obvious? You buy the mount again! Why does this guy have to be so noisy? =/ Every time you sell something to him, he produces a loud mechanical sound. Every time! I never used the Alliance version of mammoth before since i mostly play Horde, so had no clue about that. And i must say, this constant noise is really annoying. I'm surprised that even now, several years after Gnimo was created, this still remains unchanged. Am I imagining things, or did he sell 修补匠的工具箱 before WoD..? I remember making my tinkers (like 氮气推进器) easily, and now I opened 尼莫's vendor window instinctively and... there's no 修补匠的工具箱. So I don't know if I imagined that, or this item was removed from 尼莫's sell list? Love it when I mount up in a busy city and immediately get spammed with the metal sounds of people selling stuff to my Gnimo. Just an FYI, if you disable DIALOG sounds under SYSTEM/SOUND settings, you won't hear Gnimo's sounds at all. Of course, you also won't hear ANY dialog sounds, lol. But perhaps someone wants to do what I do and just temporarily disable it while I am using my Mammoth. As of 7.1, no longer makes the loud mechanical sound. Rejoice everyone as of today (patch 7.1) Gnimo no longer makes his annoying noise!